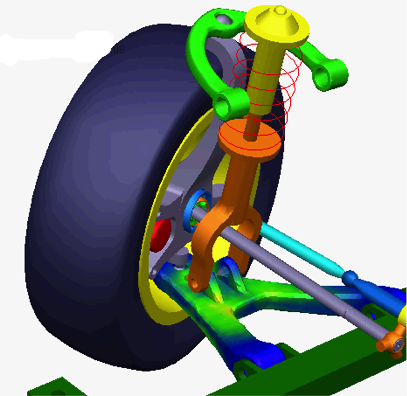 Multibody dynamics (MBD) simulations with Adams are used by engineers to study the dynamic behavior of mechanical systems across all industries. 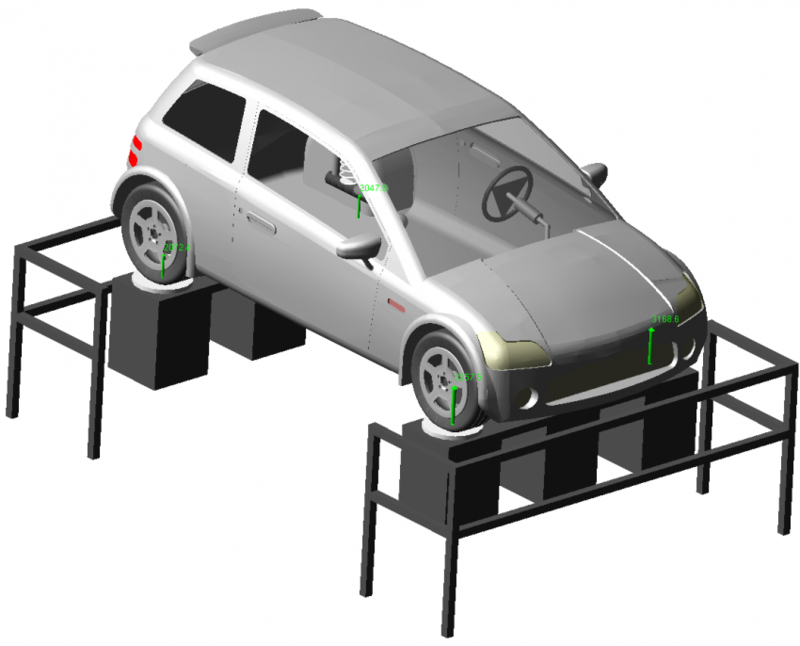 From simple linkages systems to full vehicle system dynamics models, Adams helps minimize the need for expensive physical prototyping and testing by utilizing accurate simulation representations. A critical element to accurately modeling physical systems is accounting for part stiffness, or compliance. Adams has a long history of providing capabilities that emulates the compliance of the physical parts such as nonlinear bushings and Flexible body representations. The workflow for generating a Flex body representation (Figure 1) involves executing a Finite Element analysis and capturing a reduced order modal representation in a Modal Neutral File (MNF). The MNF contains information on the flexible body and in terms of mode shapes and frequencies as well as the connection points with the rest of the assembly. The rigid body representation in the analogous MBD model can then be replaced with the flex body representation in the MNF file to simulate flexibility in the assembly. While the Flex Body representation enables a more accurate prediction of performance early on in development, often sacrifices speed (run time) for this accuracy. This is especially important earlier on in the conceptual phase when you may be exploring tens, hundreds or even thousands of design options. MBD analysts often settle on lower-fidelity purely representations, to get answers in the timeframe they have available. With the intent to provide users with the right balance between accuracy and performance a new, faster-solving simplified flex body solution method has been included in Adams 2019. Using the simplified approach, the solver extracts compliance characteristics based on the content of the flexible body’s original modal definition in the MNF file. This method retains most flex compliance characteristics but omits some dynamic effects to achieve faster solution times. Solution speedup of 1.5X-4x has been observed in early benchmarking with this simplified approach. The solve time reduction from using the simplified method is more significant the more modes in the flexible body and the more attachments to the flexible body. Certain limitations exist with the new method. As an example, flexible body contact is unsupported. 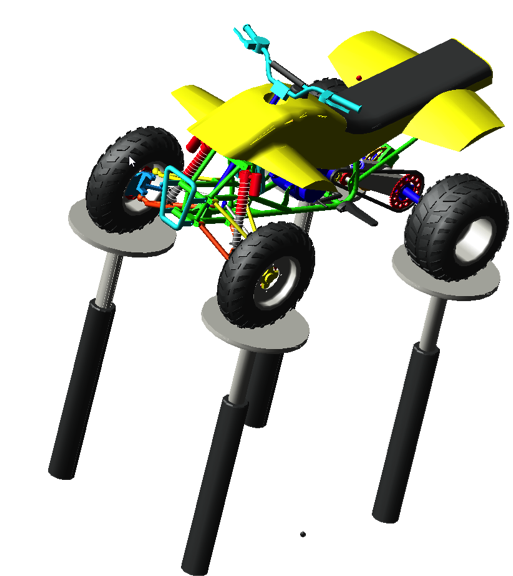 Let’s look at a comparison between the standard flex and the new simplified solution method using a model of a four-wheeled all-terrain vehicle on a four-post shaker (Figure 2). The frame of the vehicle is modeled as a flexible body. Multiple portions of the suspension (control arms, shocks) connect to the frame. As seen, in Figures 3 and 4 the simplified method captures component loads to an acceptable level of accuracy. The Simplified method also provides a solution acceleration of 4X. With an intentional tradeoff between solution accuracy and solution speed, Adams user now have the opportunity to rapidly evaluate designs concepts while accounting for compliance, using the Simplified Flex body method in Adams Release 2019.